A homeless axe-wielding drifter turned out to be a hitchhiker hero this week, and is now inspiring copycats. Kai – the only name he would give – stopped a raving, racist lunatic who claimed he was Jesus reincarnated. It was no miracle, however, when the insane driver rammed a man up against his truck, and and then tried to squeeze the life out of a woman bystander. Presumably the “holy man” was just helping people get to heaven more quickly. 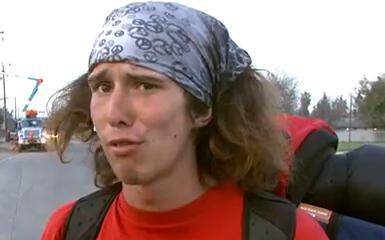 Kai, the homeless hippy surfer dude ax-wielding hitchhiker hero. That’s when our unlikely hitchhiker hero sprang into action. Kai bashed the lunatic in the back of the head with his axe, saving the day. His expletive-rich hip surfer-dude interview by a news station, given after the incident, quickly went viral on YouTube. Kai is a very unique national hero, having taken an ingrained stereotype and turning it on its head. Now it seems his good deed is inspiring copycats. In Kansas City yesterday, for instance, a bank robber stopped mid-escape to help an old lady across the street. She tipped him for his trouble. He got away. Westboro Baptist Church founder and pastor Fred Phelps Sr. decided to stop praying for people to die and hassling funeral goers, and embrace “the gay within” instead. In Texas, the Koch brothers made an about face, withdrawing their support for sucking the tar sands gook from Canada down to Texas, and use the pipeline for distributing Moosehead beer instead. In Miami, a bomb-wielding jihadist blew up a terrorist sleeper cell, saying Kai’s video gave him a change of heart. Now he wants to go into the demolition business – the legal kind. And in New York City, even Brian Moynihan, CEO of Bank of America, was inspired to do good. Moynihan decided his bank ought to participate in the Home Affordable Modification Program (HAMP) after all, if just to help one lucky customer revise a mortgage, thus saving their home. However, when bank management tried to carry out his request, it was so unique that nobody in the company knew quite how to handle it. In late-breaking news, the problem seems to have caused a bottleneck in the entire financial system, initiating a cascade effect that experts say may well result in another economic collapse. President Obama has said he will spare no effort to deal with the crisis, and has issued a call out for Kai to save the day — wherever he may be.